The NFS dialog applies only if you are installing from an NFS server (if you selected NFS Image in the Installation Method dialog). Enter the domain name or IP address of your NFS server. For example, if you are installing from a host named eastcoast in the domain example.com, enter eastcoast.example.com in the NFS Server field. Next, enter the name of the exported directory. If you followed the setup described in Section 2.5, “Preparing for a Network Installation”, you would enter the directory /export/directory/. 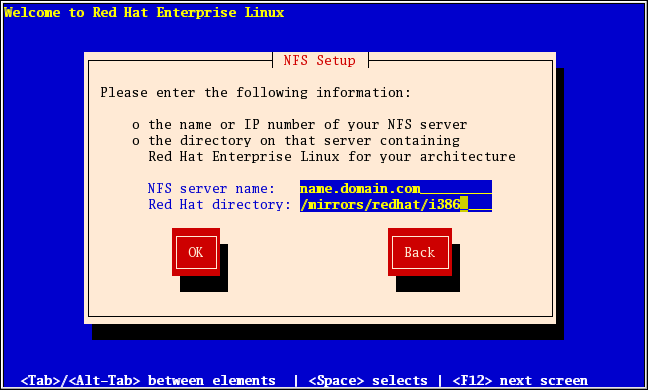 If the NFS server is exporting a mirror of the Red Hat Enterprise Linux installation tree, enter the directory which contains the root of the installation tree. You will enter an Installation Key later on in the process which will determine which subdirectories are used to install from. If everything was specified properly, a message appears indicating that the installation program for Red Hat Enterprise Linux is running. If the NFS server is exporting the ISO images of the Red Hat Enterprise Linux CD-ROMs, enter the directory which contains the ISO images.